Rabbi Simcha Weinstein and I became Facebook friends recently. We’re not even quite sure how it happened. But when I read this his bio, I wondered how in the world I’d never heard of him. An Orthodox (Chabad) rabbi who works at a prominent New York City art school (Pratt, which I applied to before I decided to major in English and forget my dream of becoming an illustrator) and loves pop culture and comic books?! And he’s a blogger and a speaker, too? Why in the world didn’t we connect early? 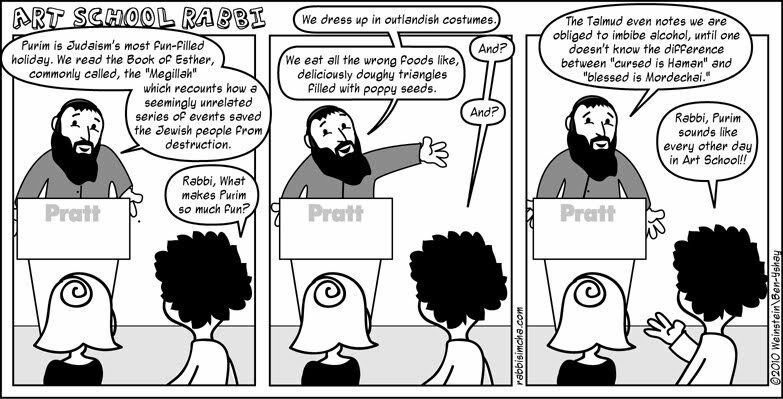 In the sixth episode of an ongoing satirical series about Rabbi Simcha’s stint as the campus Chabad rabbi at Pratt, Art School Rabbi Purim Special (click to see a more eye-friendly size version of the comic), Rabbi Simcha explains the joys of Purim (which starts Saturday night). Next Post What do the kids in Meah Shearim wear on Purim? wow, before I even read that Superhero link, I wanted to tell you about my friend Marc Tyler Nobleman who wrote a book about the creators of Superman. He doesn't go into the Jewish element, but there is one page where you can see the shabbat candles. It's a great picture book. You can find him at http://noblemania.blogspot.com/ I'm glad you're still writing. I enjoy reading your blog posts!